With every mile you drive, your car's power-steering cylinder is subjected to dust, rain, sand, and dirt. All these elements catch up with it over time, making wear inevitable. If yours is leaking or just old, you can replace it or rebuild the one you have. The two areas of difficulty in a Corvette p/s cylinder rebuild are getting the old pieces out, and not damaging other areas in the process. 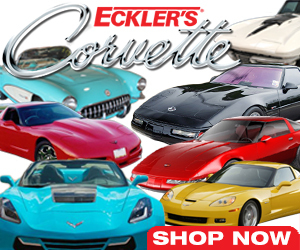 Power steering was an option on Corvettes from 1963 to 1976, and became standard equipment in 1977. Although the pumps and gearboxes changed several times, the power steering control valve and cylinder remained pretty much the same. Rebuild kits for the cylinder cover all C2 and C3 Corvettes (1963-1982). The hydraulic steering cylinder applies a force to the steering gear, which in turn steers the wheels. The steering wheel operates the control valve, which controls flow to the cylinder. The control valve allows fluid to flow to the cylinder which provides steering assistance. 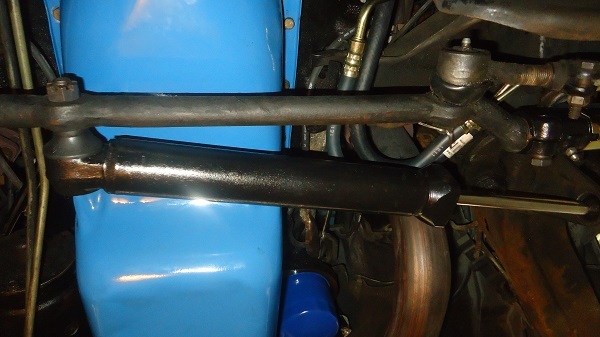 The steering cylinder, sometimes referred to as a ram cylinder, is mounted between the front wheels under the engine oil pan. On the left side is the rod end, which attaches to a bracket. On the right side, the ball stud end goes through a hole in the steering centerlink, more correctly called the relay rod. 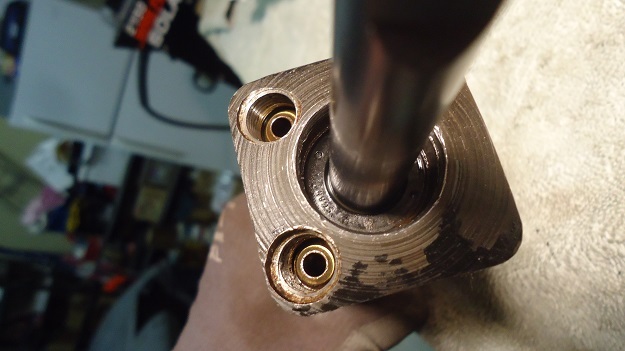 Rebuilding the cylinder consists of removing, then reinstalling, two washers and two seals that are located where the cylinder rod enters the cylinder housing. The seals act as dirt scrapers to clean the rod before it retracts into the cylinder. 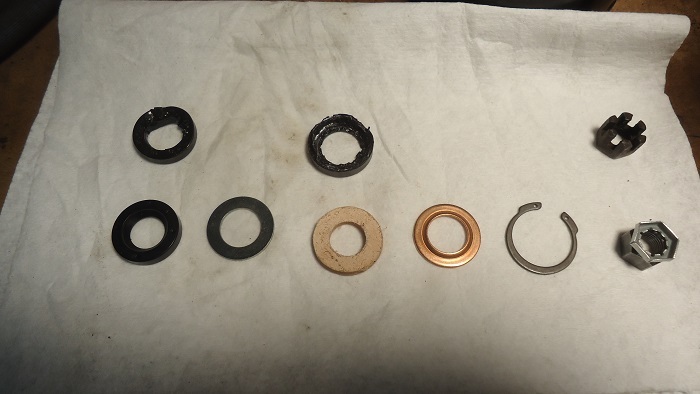 Rebuild kits come with two non-metal washers and two metal washers. These four pieces are stacked on top of each other and held in with a snap-ring. First, you need to check if yours can be rebuilt. Removal is as follows: Carefully put your car up on four jack stands. 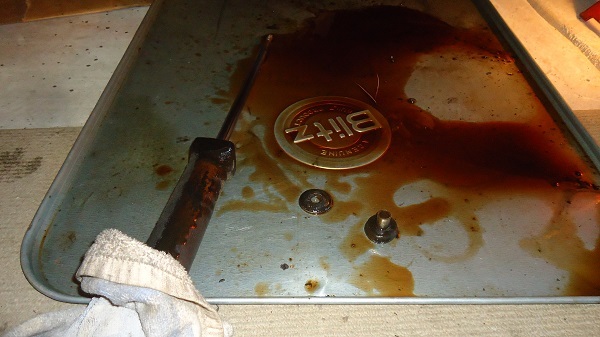 Remove the two hoses using line wrenches and let them drain out into a tray. 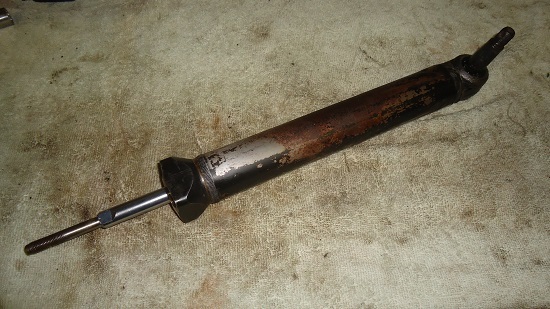 The left-side rod end is easily removed with a 9/16 and 7/16 socket. 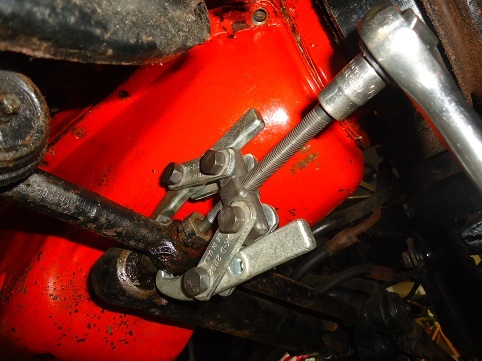 Removing the right-side (ball-stud) end out of the relay rod requires either a puller or ball-joint fork. I used a two-jaw puller. After removing the cylinder from the car, hold it with the ball stud up over a large tray. 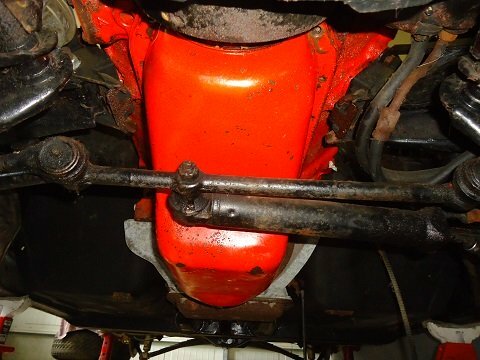 Push and pull the shaft slowly to drain out the old power steering fluid. I found the Corvette p/s steering rebuild to be a quite a messy job. After the hoses are disconnected, do not move the front wheels or you'll spray power steering fluid all over your garage floor! Please dispose of steering fluid properly. It gets recycled with used engine oil. 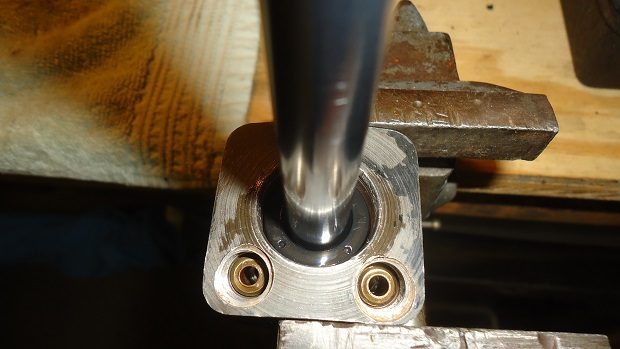 With all the fluid out, place the cylinder on a heavy rag or towel on your workbench, and inspect it carefully. 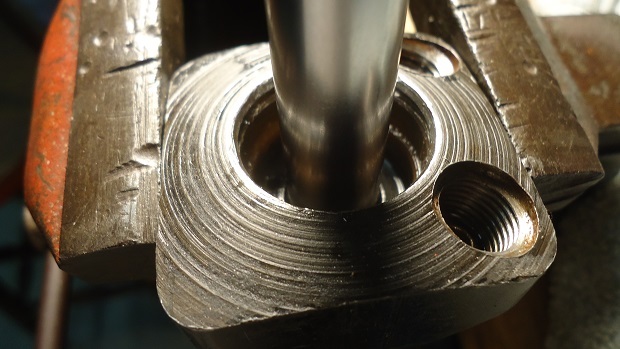 If the body is badly dented or if the rod binds when moving in and out of the cylinder, it may not be reusable. Take a look the port threads and make sure the seats are OK. Also check the ball stud for excessive play in its socket. If the shaft is bent, pitted, scratched, or missing chrome plating, the cylinder is not rebuildable. If the outside looks good, take it apart. If it comes apart easily, chances are it will go together easily. For cleaning, I used brake parts cleaner and an air blower to blow out any loose dirt and residual oil from the seal area. Wearing eye protection is a good idea. 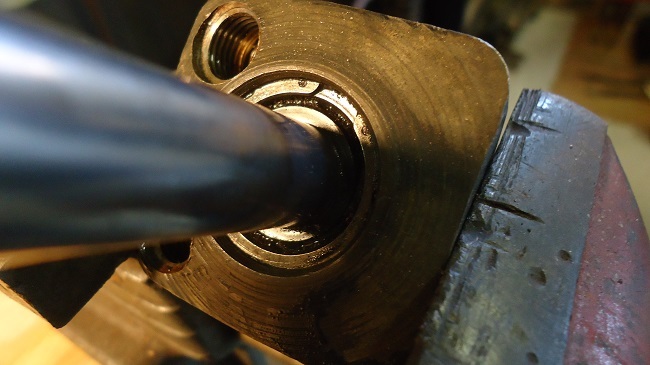 Dozens of internet companies sell power steering cylinder rebuild kits. Instructions are not included, and neither of my Corvette shop manuals describe in detail how to re-seal the cylinder. So, I took mine apart carefully, taking notes and pictures. If your cylinder does not have seals that look like the ones in the kit, don't be surprised. Neither did mine. Several styles were used and are interchangeable from 1963 to 1982 models. 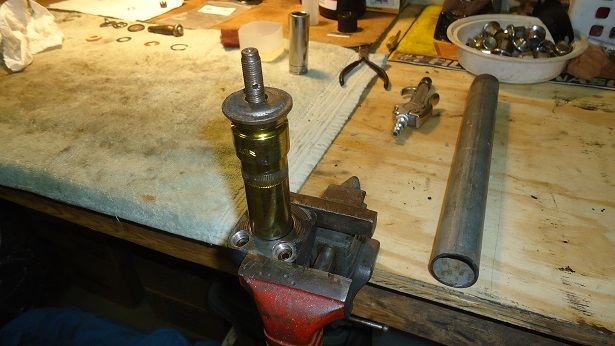 Place the cylinder upright in a vise as shown. With a pair of internal snap-ring pliers and a small flat-blade screwdriver, remove the snap-ring and set aside. 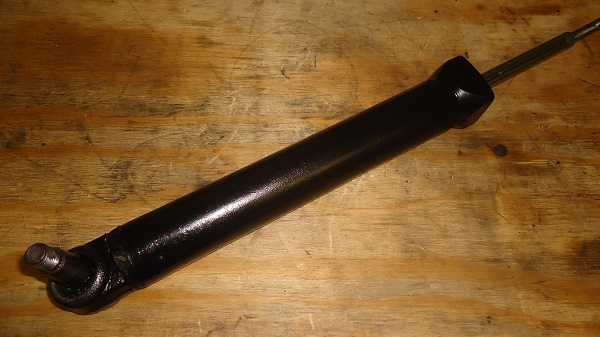 The steering cylinder that came out of my '82 Vette had a hard rubber washer instead of a copper washer. I had to pick it out. 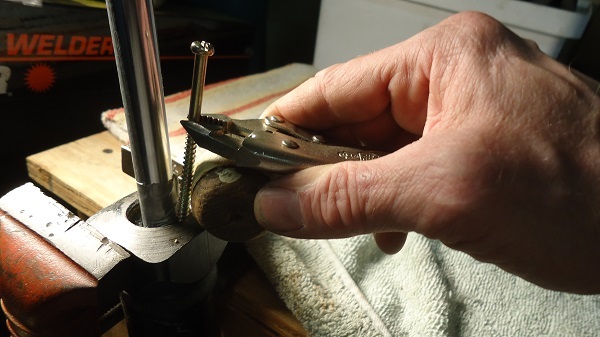 If you have a copper washer, remove the cylinder from the vise and tap the shaft on the anvil of the vise. This may jar it loose. Under the seal/copper washer is the back-up washer. If it doesn't come out easily you'll have to pick that out also. So as not to nick or mar the shaft, I wrapped the bottom of the rod in duct tape before proceeding to the next steps. I used a sharp pick to pull the seal wiper upwards (yours may have a leather washer), then pull it off the shaft. There's not enough clearance between the cylinder rod and the cylinder body to get a tool in to to pry that bottom washer out. 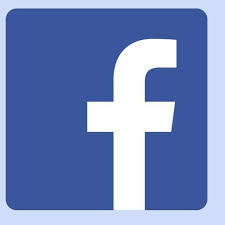 There are several ways to remove the seal. This is the method that worked for me. Use a small-diameter wood-screw to grab into the old seal. 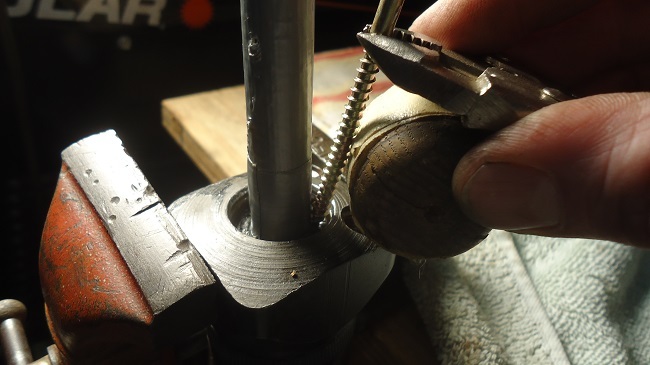 With a small pair of vice-grips holding the screw, lever it out using a 2" round piece of wood for a fulcrum (see pictures). After disassembly, inspect the seal area. Look for scratches or grooves on the inside edges. Clean with solvent and lube the rod with power steering fluid. You may want to paint your cylinder before reassembly. I used brake-parts cleaner to clean it, then masked off the rod and hose ports. Apply several lights coats of semi-gloss black, waiting 5-10 minutes before each coat. Give the paint a day ot two to dry before reassembling. Seals and retainers get lubed with power steering fluid before installation. The rubber piston seal is installed first. The backing washer goes on top of it. Next is the scraper, which seats against the backing washer. The copper washer goes on last, followed by the e-clip. To get the e-clip to go back in its groove, the seals and washers must be pressed down. The best way to do this is to use either a socket or a piece of pipe that will fit over the rod. I used both, with a washer from the ball stud in between. Try not to hammer too hard at first, it may go down easier than you think. Checking and/or replacing the ball-stud on the other end is the easier part of the rebuild. 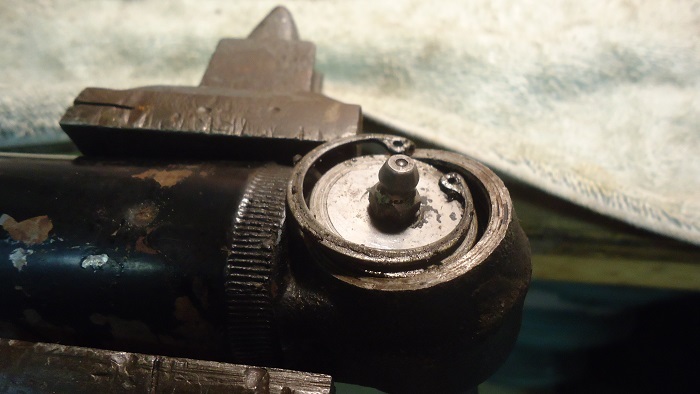 If the ball stud checks out in terms of wear, all that's necessary is a disassemble, clean, and reassemble. The ball stud end has five pieces. 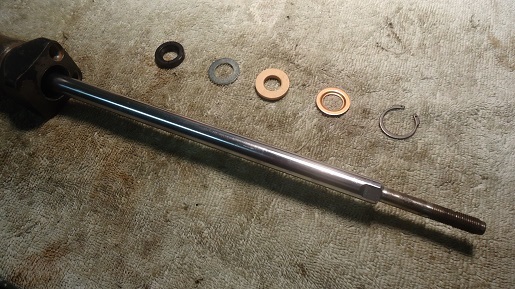 In order of how they are re-assembled, they are the ball stud itself, the skinny rubber o-ring, the dimpled washer (which faces up), the curly spring, the washer with the grease fitting, and the e-clip. Once everything's back together, pump in some chassis grease just until it starts oozing out. Then install the ball stud boot over the ball stud. Once back on the car, a castellated 1/2" x 20 slotted nut goes on the ball stud with the spacers and rubber washer. The rod end gets the smaller, 1/2" x 20 slotted nut. Both ends get cotter pins. This Corvette p/s cylinder rebuild took me 3 to 4 hours over the course of several days. Before I ordered the rebuild kit, I took the cylinder apart, just in case it was not rebuildable. Rebuilding your power-steering cylinder is less expensive than a replacement unit, and also keeps your classic Corvette as original as possible.